Tyree Fletcher goes around a pick and drives to the basket during Butler’s 62-14 win over Sidney. Gracie Price drives to the basket during Butler’s 62-14 win over Sidney. 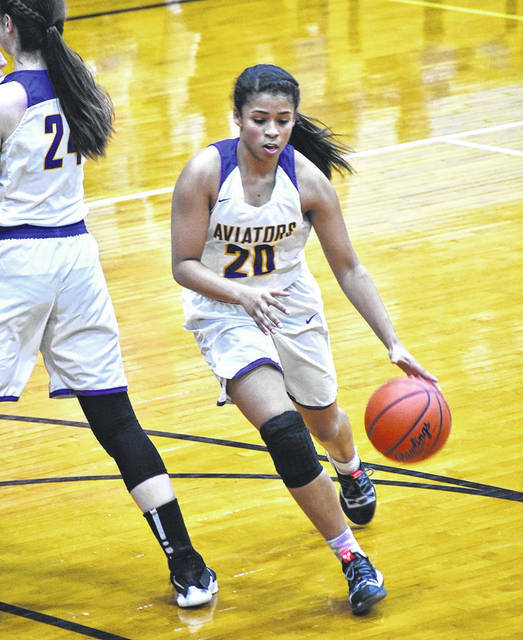 VANDALIA — The Butler Aviators left nothing to chance on Wednesday when they hosted the Sidney Yellow Jackets on Senior Night on Wednesday. With three players in double figures and 10 different Aviators scoring, Butler crushed Sidney 62-14. The win, Butler’s seventh straight, lifted the Aviators to 13-8 overall and 10-4 in league play where they remain in second place alone. Butler can clinch second by themselves with a win over first place Tipp on Saturday. Wednesday’s game was never close. Butler jumped to a 21-7 lead after one period and led 40-11 at half. The Jackets managed just 3 points of offense in the second half as the Aviators cruised. Tyree Fletcher led the way for Butler with 15 points and 15 rebounds along with 4 steals. Abbie Schoenherr had 13 points and 6 assists while Gracie Price had 11 points. Prior to the game, the Aviators honored three seniors – Fletcher, Schoenherr, and Rachel Burton. “These three seniors have meant a lot to me,” said Bardonaro. “They don’t act like seniors ready to be done or moving to the next thing. They have been quiet leaders, steady, and doing what they need to do. They don’t go off our game plan and always giving 100 percent. All three of these girls are going to go on to do great things. 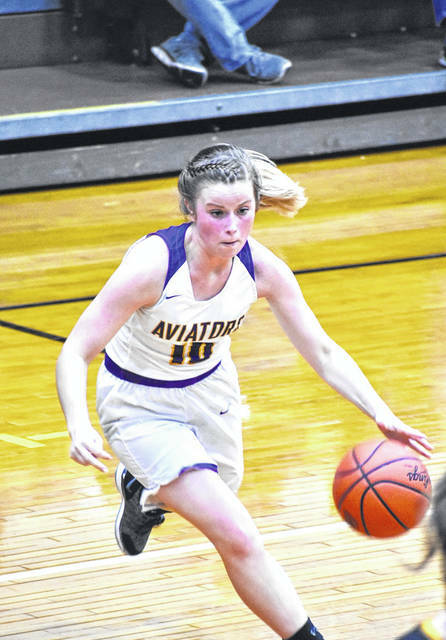 Shoenherr and Fletcher have played key roles for the Aviators and both have been top three scorers for the past three years. “Abbie has been fun to watch grow both physically and as a player,” said Bardonaro. “She is tough, tougher than you expect and is the ultimate team player and always finds the open player. Sometimes I have to remind her that she’s the open player and to take the shot. Butler will close the regular season on Saturday at Tipp and then have a week off before opening tournament play against Beavercreek. That game will be held Saturday, Feb. 16 at 4 p.m. at Troy High School.